CC 690 Power Sluice - FREE SHIPPING! Based on the results of real researchers who conducted tests of existing placer gold recovery operations to determine which equipment designs were most efficient in retaining gold of all sizes, the design of the CC690 incorporates their findings and is not just based on the traditional design of sluices. This product was designed and perfected over a 2 year period to help small scale gold miners like you extractg the greatest percentage of gold possible from the gravel you feed into it. The CC690 is a water operated, centrifugal concentrator and is capable of processing large volumes of material without the need for pre-classification. Existing sluice designs rely mainly on gravity to capture gold. With the CC690, not only is the force of gravity at work to trap gold, but the very force of the water itself is used to create high energy vortices that trap and hold gold particles against the matting. These forces combine to help the smaller particles work their way deep into the looped, vinyl fibers of the matting and on down to the grooves of the underlying, v-ribbed rubber mat where they remain until it is time to perform the clean up operation. This product is user friendly— no tools are required for use, and no small parts. All materials used in the construction of the CC690 were chosen for their corrosion resistance, quality and durability, so this power sluice / highbanker will survive season after season! IMPROVED GRIZZLY! Manufacturer added more cross-spars to prevent those long, skinny rocks from getting through, a flat plate was added to the back of the grizzly to prevent material from being shoveled through the back, and the frame is now continuous around the whole grizzly. 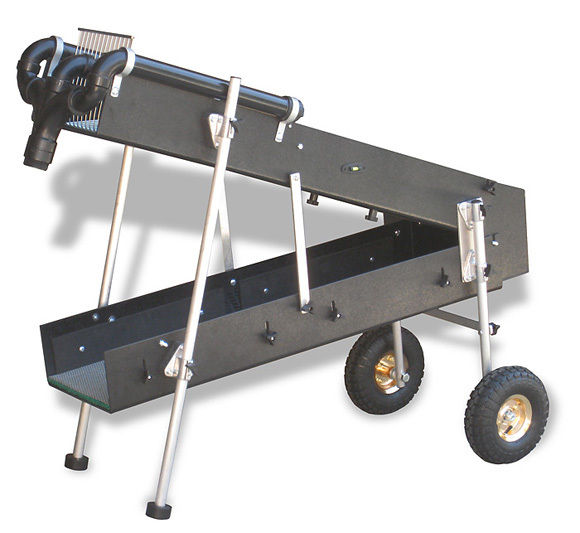 FREE SHIPPING on the CC690 Power Sluice / Highbanker (70 lbs)! Also sold here as a package with a pump and hoses.